To receive the news “You have cancer” is a life changing experience. In November 2014, ailment Nigel Lloyd-Jones was diagnosed with cancer. He has chosen to share his story, sildenafil in his own words, erectile to illustrate how he and his wife coped with the diagnosis and ensuing treatment. To receive the news “You have cancer” is a life changing experience. For Nigel Lloyd-Jones and his wife Sheena this was particularly shocking as, prior to the diagnosis, Nigel had been fit and well with a busy career. The lump on his neck had been inspected by his GP several times and when finally removed, was described by the medical team as, “looking benign”. Biopsy results, however, revealed a Head and Neck cancer, diagnosed as a squamous cell carcinoma with no evidence of a primary cancer. The initial treatment recommendation was for a radical neck dissection, further biopsies and continuing treatment. 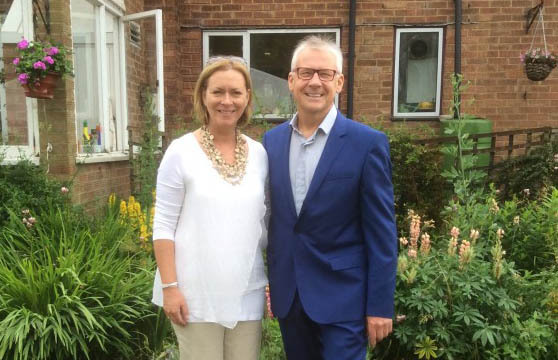 Having discovered that a second opinion was a patient’s right and, with the help and support of his immediate family, Nigel was referred to The Royal Marsden Hospital where he met Professor Chris Nutting and his team. The Royal Marsden was Nigel’s family’s natural choice. His mother, has a 28 year relationship with ‘The Friends of The Royal Marsden’ charity and both his father and brother-in-Law were treated there. Almost immediately after referral, Professor Nutting recommended a course of radiotherapy, with surgery as an option, albeit a last resort. On Christmas Eve, the treatment ended and Nigel and Sheena returned home to Cheltenham. The next 3 months proved intensely challenging as, despite the support of friends and family, the side effects of treatment dominated every waking moment. However, positive signs were on the way. During a routine check- up visit to The Royal Marsden, Nigel was able to eat an egg sandwich (minus the crusts) which had been prepared, so fittingly, by one of the volunteers in the ‘Friends Café’.